I can't take credit for this. 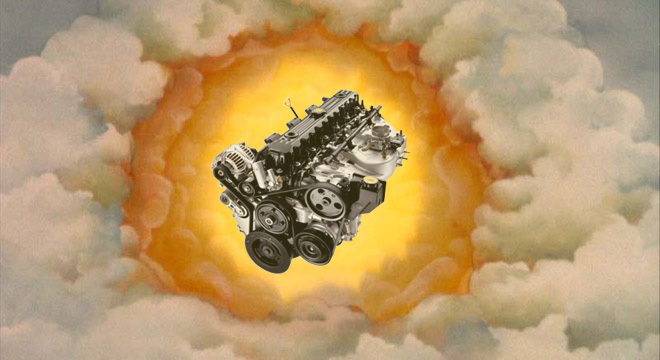 I found it in a Mopar forum while trying to find pricing info on the new I6 4.7 stroker crate engine available from Mopar. The original Jeep 4.0L inline-six was hewn from a solid block of granite by lightning bolts. Its cylinders were bored by the Imperial Winds and its rotating assembly was balanced by the Scales of Justice. The Ancient Egyptians used Jeep 4.0L engines to move the blocks which built the Pyramids, only switching to slave labor when it was found to be cheaper than the olive oil used to fuel the engines. Scientists have ranked the Jeep 4.0L engine as one of the strongest forces of nature, racking right up there with tectonic plate shifts for its low-end torque, and being surpassed by hurricanes only for its comparatively low redline. Mechanics have found imprints of fossilized dinosaur bones in block castings, and serial numbers in Roman numerals are a common sight. The design of the 4.0L's fuel injection system has been traced to the archives of Leonardo DaVinci, and early manuscripts of Shakespeare plays have been used as head gaskets for this engine (which, incidentally, explains the gaps in Shakespeare's collected works as well as the 4.0L's tendency to leak oil). The engine's ancient roots also explain its ability to run on some very non-conventional fuels (original translations of the Rosetta Stone include evidence of Jeep 4.0L engines running on ox blood) as well as lubrications (during the Middle Ages, Jeep 4.0L crankcases were often filled with barley, with no detrimental effect on power output). Historians maintain that the fall of the Roman Empire hinged on their inability to design a superior engine, and had the Titanic been powered by a 4.0L Jeep engine, 1912 might have been a much happier year. Yes, had early-20th-century naval engineers had a touch more foresight, the Jeep 4.0L may have saved mankind from ever having to endure Leonardo DiCaprio and Celene Dion in the same sitting. Posted this a year ago...still think it's funny and worthy of a bump. You are correct sir, but you forgot the lost pages of the bible that state Jesus will come back in the apocalypse to defeat Satan riding a chariot of Jeeps with 4.0L engines, and his holy weapon shall be the golden high-lift jack of Rubiconia. And when Washington drove an XJ (with the 4.0 of course) into battle against King George, who only had a Land Rover, and won our independence... everyone knows that's what REALLY happened during the revolution. I had to make this when I found this thread again. Alright, so I'm a noob when it comes to engines. How is it that this one has such a high HP/torque rating? I wasn't even aware that a I6 could get that high. Dude... you need to make that picture in 1920x1080, gets all pixelated when I set it as my desktop wallpaper.